Make friends, find love and more in 160 characters or less! 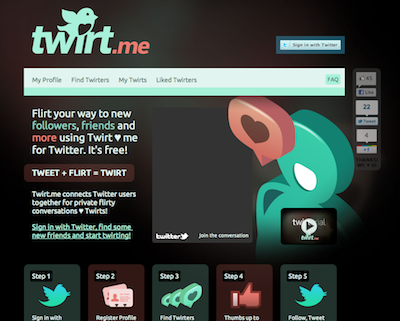 Twirt.me pairs up individuals for flirty tweets – twirts. Tweet directly to a Twirter who is looking for someone like you! Twirt.me focuses more on connecting with people textually and less about picture matching. Our users enjoy engaging with eachother, gathering likes and followers.